Lisa is a leader and active in the human resource community with over 25 years of hands-on industry experience in the public, private and federal sectors. She fell into human resources after serving almost 10 years as an Army Officer. Leadership is people, purpose, passion and power and she immerses herself in it every day. She earned her Senior Professional in Human Resources (SPHR) designation in 1997 and is an active mentor to up and coming employees in her organization and community human resource leaders. Lisa is a writer and has managed lisarosendahl.com since October 2006 and was recognized as a Top 25 Employer Blog by Spark Hire, Fistful of Talent, HR Examiner and Unbridled Talent. 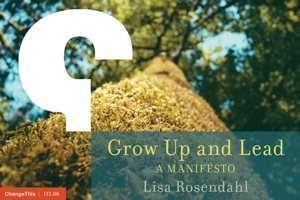 Her manifesto, Grow Up and Lead, is live on ChangeThis. Lisa is co-founder and past editor of womenofhr.com, a multi-contributor blog dedicated to women in human resources and business. She is on a quest to hone her voice , "the intersection of passion and what resonates with others," and writes to make a difference. Lisa is an engaging presenter on leadership and human resources issues. Lisa presented at the Federal Workplace Conference and other speaking engagements included the HR Florida Conference and Exposition, HR and EEO in the Federal Workplace Conference and Association of Legal Administrators of Minnesota (ALAMN) Educational Conference. She motivates audiences with stories of how bringing the best of who you to any situation can make all the difference in the world. Lisa is an active participant in a variety of social networks to build connections and stay abreast the latest information, research and thoughts in the leadership and human resources fields. She knows that social media is a tool and the real connections occur with a phone call or a handshake. Leadership in today's organizations require more and Lisa knows we can not do it alone. She turns to the people in her network who continually inspire her thinking and provide her with new ideas.